It’s possible to take covert pictures of people with your phone by pretending to text in a weird way with your phone up at the same level as your face while actually taking a picture. But it’s awkward and looks dumb if you pull it off and creepy if you don’t. 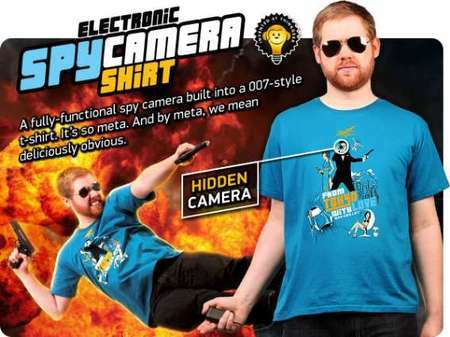 Anyway taking secret spy photographs of people will get a lot easier with arrival of ThinkGeek’s T-shirt with Spy Camera. The super slim camera is cunningly disguised as part of the pattern on the front. In a daring double bluff, the camera lens is actually in a picture of a camera lens. Still, because it’s very rare to find people with cameras hidden in their t-shirts, I think you could get away with this. Just have a good excuse if they discover the attached battery pack and little clicky thing that decides when you take a picture. The shirt’s concealed color digital camera will allow spies-in-training to capture 150 photographs at 640 X 480 resolution before they have to be downloaded to a computer via the included USB cable and wiped from the shirt’s memory. It takes 3 AAA batteries, doesn’t work very well at night (flash would kinda give it away) and we’re not sure how you wash it… but hey, think of all the covert spy shots you can take of people in the train. – do it!